Deluxe class hotel, located 2 miles from the O'Hare International Airport and 16 miles from downtown Chicago. Warm and inviting guest rooms feature French decor and include: individual climate control, work area with desk, nonsmoking and ADA approved rooms available, remote control color TV with cable and in room movies, mini bar, direct dial telephone with modem/data port connection and voice mail, sitting area, iron and ironing board, alarm clock radio, bathrobes, shower massage, hair dryer and nightly turndown service featuring a fresh rose and a bottle of Evian water. Hotel amenities include: 24-hour complimentary airport shuttle, parking, indoor swimming pool, fitness center, restaurant and lounge. 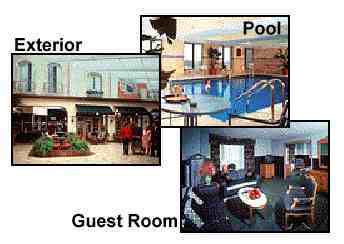 Hotel is a short drive to Lake Michigan, Northwestern, University of Illinois, City Centre, Great Lakes military base, Wrigley Field, Maywood Race Tracks, Chicago Loop and the Chicago Board of Trade. Hotel is minutes to fine dining, shopping and entertainment. Please note the following dates require a 7-day cancellation notice: September 14, 26, 27, 28, 2000, October 2, 3, 4, 13, 14, 15, 2000, November 13, 14, 15, 2000, December 31, 2000, February 23, 24, 25, 26, 2001, March 9, 10, 11, 12, 13, 2001.